I have only really heard about Leather Earrings recently. When I first heard about it, it sounded like a really funny thing to do, but when I looked into it more I found they are very high fashion - especially if they have fringing on them. A lot of them are quite African inspired - these first ones are massive! 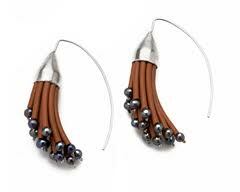 Leather earrings are good however because they are really light. 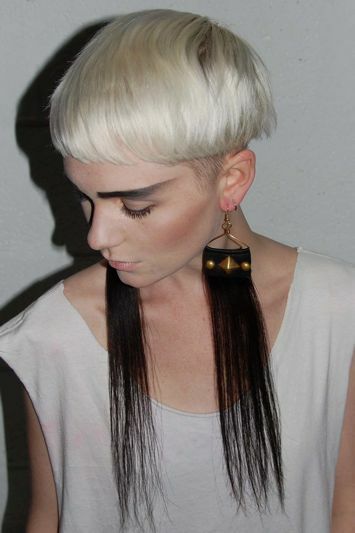 I loved these hair and leather earrings. They are crazy and I would never wear them! But they are high fashion and something different, and at the end of the day just because they are crazy, you would go noticed wearing them. Saying so, you would have to have your hair up for the earrings to be properly seen, and give the full effect. A sleek ponytail or high bun would look great. Slicked back hair and big earrings works a treat. These leather earrings would look really nice with a high bun, maxi dress and sunnies on holiday. Because they are such a statement, you don't need very bold prints or much make-up, and when you have a tan you will look gorgeous anyway.